We’d love your help. Let us know what’s wrong with this preview of Leading Change by John P. Kotter. John Kotter’s now-legendary eight-step process for managing change with positive results has become the foundation for leaders and organizations across the globe. By outlining the process every organization must go through to achieve its goals, and by identifying where and how even top performers derail during the change process, Kotter provides a practical resource for le John Kotter’s now-legendary eight-step process for managing change with positive results has become the foundation for leaders and organizations across the globe. By outlining the process every organization must go through to achieve its goals, and by identifying where and how even top performers derail during the change process, Kotter provides a practical resource for leaders and managers charged with making change initiatives work. Needed more today than at any time in the past, this immensely relevant bestselling business book serves as both visionary guide and practical toolkit on how to approach the difficult yet crucial work of leading change in any type of organization. Reading this highly personal book is like spending a day with the world’s foremost expert on business leadership. You’re sure to walk away inspired—and armed with the tools you need to inspire others. To ask other readers questions about Leading Change, please sign up. Kotter proceeds to explain his eight-stage process of creating major change that consists in (1) establishing a sense of urgency (2) creating the guiding coalition (3) developing a vision and strategy (4) communicating the change vision (5) empowering broad-based action by getting rid of obstacles and changing systems or structures that undermine the change vision (6) generating short-term wins (7) consolidating gains and producing more change (8) anchoring new approaches in the culture. I don’t Kotter proceeds to explain his eight-stage process of creating major change that consists in (1) establishing a sense of urgency (2) creating the guiding coalition (3) developing a vision and strategy (4) communicating the change vision (5) empowering broad-based action by getting rid of obstacles and changing systems or structures that undermine the change vision (6) generating short-term wins (7) consolidating gains and producing more change (8) anchoring new approaches in the culture. I don’t think the book actually adds anything more than his article ‘Leading Change’ published on the Harvard Business Review a year before. This book is a stalwart when it comes to managing change in organizations. In a more detailed and applicable way than the book Who Moved My Cheese (different author), Kotter touches on how to face change, saying that individuals that want to succeed in organizations in this age must be ready for it and the fact that it will come faster. Kotter presents two very good points: One is an eight-stage process to implement changes. And two, a very interesting premise about leadership vs management, which was mentioned in several other books on the Level II reading list, speci In a more detailed and applicable way than the book Who Moved My Cheese (different author), Kotter touches on how to face change, saying that individuals that want to succeed in organizations in this age must be ready for it and the fact that it will come faster. Kotter presents two very good points: One is an eight-stage process to implement changes. And two, a very interesting premise about leadership vs management, which was mentioned in several other books on the Level II reading list, specifically Working With Emotional Intelligence. The table below summarizes this. In fact, in my graduate courses, the ideas Kotter writes about were mentioned frequently in a class called Strategic Management, as well as the marketing and a personal development classes. Those instructors obviously were reading Kotter’s very good ideas about vision, leadership, and management. Central to the book is an eight-stage process for creating change, which is based on a number of errors business could have avoided, says Kotter, between1986-96, had they made major changes. While the business world was looking at effects of globalization, the Corps was just beginning to face reforms with major change. As I read this book, I reflected on the Project Management Business Process (PMBP) and how that was a major change for the Corps. General Flowers must have realized that the old guard would not easily embrace the new PMBP or P2, and I wonder if he counted on turnover, at least retirements, to be part of the culture change, hoping the next gens could fire it up. 2012 was far enough off in the future that this may have been in someone’s mind. The Corps needs management and leadership to stay relevant. Managing change is important, says Kotter. Without a competent manager in control of the transformation process, chaos can take over. More important is leading the change. Only leadership can spur the team on when motivation must be found. This is why a vision will serve the process for major change. The Corps did this with the CDs for the PMBP. Many laughed at the CDs and what was in them: PMBP proposed matrix organization, integrated processes, empowerment, and level of engagement. This is the same stuff taught in the Engineering Management graduate courses. Leadership will only be possible if staff will take advantage of educational opportunities that are offered. For me, this is easy, since learning is my leading strength. Corps staff should realize that these opportunities do not come as easily to outside staff at consulting firms. Our work is closest to the action, so many of our employees have a lot of knowledge to share. Prospect courses and opportunities like the Planning Associates Program allowed me to develop and understand why the Corps process is setup a certain way: the result is a better ability to lead, because you can establish a vision with direction to help motivate a team. Even if you’re not the project manager (PM). The Eight-Stage Process of Creating Major Change. Read in a book club with my boss. This book was fantastic- straightforward, with real techniques and lots of ideas threaded throughout the concepts. This book empowers any level employee to suggest and make changes. Highly recommend to anyone involved in change efforts (small or large) in their workplace. Seems to be focused on very large organizations. Found the way the information is presented made it almost impossible to logically follow or learn from. And the information was of such, that I didn't really care for anything they said. The only thing they said that made sense was that there is a big difference between management and leadership. And where the one falls short and the other should take over. "A good rule of thumb: Whenever you hear of a major restructuring, reengineering, or strategic redirection in which step 1 is 'changing the culture,' you should be concerned that it might be going down the wrong path." Interesting read - but not widely surprising. Goes into an 8 step process for leading change. Very high level and theory based. Key for leaders is creating and communicating vision then pulling together a team to make it happen. The 8 steps are helpful - but also unclear. Complacency increase the risk of failure! I would recommend this reading to the leaders who are launching themselves in the work related to the change management. The book depicts a clear path from creating the urgency to sustaining the change in the culture while using very visual examples & proven practices. Please note that even if an author focuses on the large organizations, there are a lot of what can be applied for any change program - big or small. PS: while reading this book I had a background feeling that it's extremely com I would recommend this reading to the leaders who are launching themselves in the work related to the change management. Fantastic book on the process, pitfalls and promise of organizational change. Addresses the environmental factors that are driving more rapid and constant changes to be necessary and how the right combination of leadership and management can keep your organization ahead of the curve. This book was recommended to me by an employee who just received an MBA. I believe this may have been part of his curriculum. It is a Harvard Business School Press publication. Leading Change is very thorough and simple to understand. I recommend the book over the audio presentation, as it is a bit deep for the audio presentation and contains a lot of lists which are better understood and retained through visual reading. Kotter lays out a solid plan complete with examples and anecdotes. Focus centers not only on what to do, but what NOT to do in trying to lead transformation. It seems there are more vivid example of what not to do in this book. 8)	Neglecting to anchor changes firmly in the corporate culture. Also, a fair amount of the discussion in this book was about management versus leadership. The only people who can really make change happen are leaders. A manager can manage processes and procedures, but it takes the vision of a leader to make change happen. I recommend this book to leaders in any organization as a solid foundation for change. As I stated earlier, I would recommend the print version over the audio version due to the depth and presentation of many lists throughout the book. 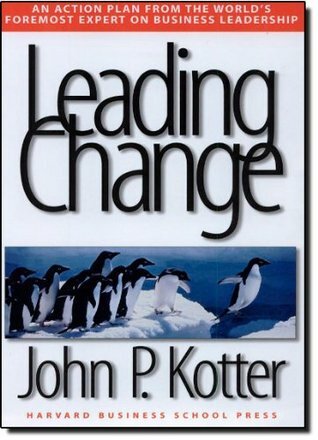 Leading Change is a somewhat dated, but still valuable and timely book that explores John Kotter’s views on the essentials of leading organizational change, as informed by his experiences with numerous companies. His eight stage process of change leadership has been referenced in numerous textbooks, and has become a source of insight for many managers and companies desiring to change the way they meet their environment and competition. 1. Establish Leading Change is a somewhat dated, but still valuable and timely book that explores John Kotter’s views on the essentials of leading organizational change, as informed by his experiences with numerous companies. His eight stage process of change leadership has been referenced in numerous textbooks, and has become a source of insight for many managers and companies desiring to change the way they meet their environment and competition. 1. Establish a sense of urgency to gain the necessary cooperation in the change effort. 2. Create a powerful guiding coalition, which will be necessary to sustain the process. 3. Develop a vision and strategy – the vision to establish a direction, cause, and alignment toward those ends, and a strategy to make it all feasible. 4. Communicate the change vision to generate understanding and common ground. 5. Empower employees for broad-based action to involve more people, in more powerful ways, in the change effort. 6. Generate short-term wins to provide convincing evidence that the effort is worth continuing. 7. Consolidate gains and then produce more change to maintain urgency and weaken resistance. 8. Anchor new approaches in the organization’s culture to ensure that they become the accepted way of doing things. It has been said that the one constant is change, and nowhere is this more true than in today’s business environment. To be able to survive and thrive in an environment that appears to be more dynamic each year, companies will need to be able to institute sweeping change from time to time, and incremental (but substantive) change almost constantly. Understanding how that is to be accomplished will be key, and the counsel in Kotter’s book is therefore an important addition to any organizational leader’s repertoire. The book talks about how to handle an organiztaion transformation. It starts by stating several common mistakes organiztaions tend to fall into. It lists them into 8 errors. Then, the book identify 8 stages that an orgnization must go through when going through a transformation: 1) Establish a sense of urgency, 2) Creating the guiding coalition, 3) Creating a vision and strategy, 4) Communicating the vision, 5) Empowering the people, 6) Ensure having short term wins, 7) Consolidating gains and d The book talks about how to handle an organiztaion transformation. It starts by stating several common mistakes organiztaions tend to fall into. It lists them into 8 errors. Then, the book identify 8 stages that an orgnization must go through when going through a transformation: 1) Establish a sense of urgency, 2) Creating the guiding coalition, 3) Creating a vision and strategy, 4) Communicating the vision, 5) Empowering the people, 6) Ensure having short term wins, 7) Consolidating gains and delivering more change, and 8) Instilling the change in the org culture. Then the book address few issues about the 21st century context. - Vision of change is critical. It must be created, formulated to be realistic, and attainable. It must be communicated well by the transformation team (named guiding coalition in the book). - Delivering short term wins is important. Changes that take a long time to deliver results fail during the course of delivery. - Creating a high sense of urgency among the people is important. Change need people to engage efficiently in the transformation process. This is a good business/ organization behavior trade book. The problem area is a real one -- how does one get a large organization to significantly change what it is doing without chaos breaking out and lots of time, energy, and resources being wasted? The book starts with a discussion of all the ways in which a change program can fail. He author then proposes a process for avoiding those mistakes. The writing is good, the organization of the book is effective, the perspective is skeptical and r This is a good business/ organization behavior trade book. The problem area is a real one -- how does one get a large organization to significantly change what it is doing without chaos breaking out and lots of time, energy, and resources being wasted? The book starts with a discussion of all the ways in which a change program can fail. He author then proposes a process for avoiding those mistakes. The writing is good, the organization of the book is effective, the perspective is skeptical and realistic. The examples could be better developed and are only partially successful. The tone is not pompous and quite down to earth - odd from the HBS. One of those books that makes much of the business world make a lot more sense when you're done. A lightbulb about successful and failed change efforts at workplaces throughout my career went off probably every two or three pages throughout the book. It has some good insights too, I think, for anyone wondering why we are doing such a crap job of transforming on a larger, societal scale to deal wtih environmental threats like climate change. This book answer the question why change in organizations fail or not achieve the ultimate goal ? to understand why , Kotter explain the eight stages required to have a successful transformation based on a long experience in consulting. The book identifies the key elements which have to be considered in order to get the desired result, Change is not easy and can't be done in short period of time. Helpful tips in leading an organization through change. I wish I had come across this book prior to some of my failed efforts at institutional change. An easy read - Kotter encourages leaders to consider the challenge of implementing change and gives practical, helpful advice in the nuts and bolts of the process. This book is written for the corporate world but can be applied to any organization. Leading Change summarizes clearly the main steps to keep in mind when leading change in an organization. It includes a lot of practical examples and good reasoning for each specific step. Recommended. Great advice on what it will take to achieve change in large, slow-moving organizations. All of the obstacles and anti-patterns were painfully familiar, and the advice seems straightforward in retrospect, but isn't obvious when you're in the middle of the problem. Awesome book to use as a guide post for leading change within an organization. Practical tools for leaders to use to create successful change initiatives in an ever changing environment. Another book that I will refer back to again and again! Great read. Really makes you reflect on the company you work for and your role there. Read it! Best book on leadership I've ever read. “Major change is often said to be impossible unless the head of the organization is an active supporter. What I am talking about here goes far beyond tha Best book on leadership I've ever read. 4 Qualities for members of the guiding coalition: position power, expertise, credibility, leadership. With strong position power, broad expertise, and high credibility. Desirable: Appeals to the long-term interests of employees, customers, stockholders, and other who have a state in the enterprise. Focused: Is clear enough to provide guidance in decision making. Flexible: Is general enough to allow individual initiative and alternative responses in light of changing conditions. Communicable: Is easy to communicate; can be successfully explained within five minutes. First draft: The process often starts with an initial statement from a single individual, reflecting both his or her dreams and real marketplace needs. Role of the guiding coalition: The first draft is always modeled over time by the guiding coalition or an even larger group of people. Importance of teamwork: The group never works well without a minimum of effective teamwork. Role of the head and the heart: Both analytical thinking and a lot of dreaming are essential throughout the activity. Messiness of the process:Vision creation is usually a process of two steps forward and one back, movement to the left and then to the right. Time frame: Vision is never created in a single meeting. The activity takes months, sometimes years. End product: The process results in a direction for the future that is desirable, feasible, focused, flexible, and is conveyable in five minutes or less. Simplicity: All jargon and technobabble mustbe eliminated. Multiple forums: Big meetings and small, memos and newspapers, formal and informal interaction - all are effective for spreading the word. Formal structures make it difficult to act. A lack of needed skills undermines action. Personnel and information systems make it difficult to act. Bosses discourage actions aimed at implementing the new vision. Employees understand the vision and want to make it a reality, but are boxed in. Communicate a sensible vision to employess: If employees have a shared sense of purpose, it will be easier to initiate actions to achieve that purpose. Make structures compatible with the vision: Unaligned structures block needed action. Provide the training employees need: Without the right skills and attitudes, people feel disempowered. Confront supervisors who undercut needed change: Nothing disempowers people the way a bad boss can. -Gives example of interdependence: If someone asks you to move something in an office, no problem. But if everything in the office is connected by wire, it’s a lot harder. More change, not less: The guiding coalition uses the credibility afforded by the short-term wins to tackle additional and bigger change projects. More help: Additional people are brought in, promoted, and developed to help with all the changes. Leadership from senior management: Senior people focus on maintaining clarity of shared purpose for the overall effort and keeping urgency levels up. Project management and leadership from below: Lower ranks in the hierarchy both provide leadership for specific projects and manage those projects. Reduction of unnecessary interdependencies: To make change easier in both the short term and long term, managers identify unnecessary interdependencies and eliminate them. Comes last, not first: Most alterations in norms and shared values come at the end of the transformation process. Depends on results: New approaches usually sink into a culture only after it’s very clear that they work and are superior to old methods. Requires a lot of talk: Without verbal instruction and support, people are often reluctant to admit the validity of new practices. May involve turnover: Sometimes the only way to change a culture is to change key people. Makes decisions on succession crucial: If promotion processes are not changed to be compatible with the new practices, the old culture will reassert itself. Recommends it for: People who must lead their group through change. In today's modern global economy, change has become an ever present reality of life. John Kotter, in his book Leading Change, cites globalization as a major force in driving change (Kotter, 1996, p. 10). Kotter takes the traditional differentiation of management versus leadership. Kotter has carefully chosen his title as Leading Change rather than managing change to provide a statement that leadership rather than management alone is needed to guide organizations through times of great change. Kot In today's modern global economy, change has become an ever present reality of life. John Kotter, in his book Leading Change, cites globalization as a major force in driving change (Kotter, 1996, p. 10). Kotter takes the traditional differentiation of management versus leadership. Kotter has carefully chosen his title as Leading Change rather than managing change to provide a statement that leadership rather than management alone is needed to guide organizations through times of great change. Kotter proposes that 8 stages of change are necessary to successfully implement and anchor change in an organization. It must be noted that Mr. Kotter's book has no references and is based on his personal experience and observations as professor at Harvard rather than academic research and findings. Most certainly Mr. Kotter's book is a commercial success, having sold millions of copies and impacted millions more people. Additionally, Mr. Kotter has credibility based upon his interaction with the leaders of American corporations and his tenure at one of the premiere business schools in the United States. In fact Mr. Kotter has reached celebrity status in the leadership book market. Leading Change continues to be an often referenced tome of truth in management, business and technical journals. Yet it remains unclear if his concepts are supported by leadership and organizational behavior theory and research. The purpose of this paper is to provide a critical analysis Mr. Kotter's 8 stages of leading change in the context of organizational behavior and leadership theory. Of interest in this first stage is the lack of discussion concerning when change is needed. The reader may be left with the assumption that fundamental change and thus urgency are always needed in all organizations at all times. This interpretation of Mr. Kotter's first stage comes with risk, especially to the new leader eager to take control and execute change. Change to address an urgent situation such as a shift in global market share is certainly valid. However, change for the sake of change is generally bad. John Luke, chairman and chief executive officer of MeadWestvaco, addresses this common penchant for change in some organizations. Kotter's stage of urgency must also be analyzed in terms of ethical considerations. Mr. Kotter espouses increasing the sense of urgency through the use of "bold or even risky actions". He recommends creating a crisis by allowing a financial loss or setting goals that "cannot be attained by business as usual". Depending upon how these statements are interpreted and executed, these guidelines have the potential to negatively affect the workforce and breach the ethical standards of utilitarian outcomes and respecting the rights of all affected parties. Artificially created or preventable financial crisis have a significant potential for a breakdown in trust between a leader and a workforce. Without trust, influence becomes extremely difficult. Mr. Kotter introduces his book with 8 errors in leading change. Error number 5 is "permitting obstacles to block the new vision". Once again, perception and interpretation of the reader becomes very important; especially in absence of detailed analysis, research or references. Obstacles could be perceived as people and organizations that must be removed. While this may be a fair interpretation for a given situation, Mr. Kotter's advice could be fuel to the coercive leader. As the sense of urgency is increased by leadership, people that Mr. Kotter later describes as snakes and reluctant players could easily be perceived as obstacles and thus be eliminated. For the reader with a truly urgent situation, Mr. Kotter provides an excellent and practical framework for executing change that is consistent with change models that recognize internal and external forces and create the need to diagnose and solve the needed change. Urgent situations most definitely require the acknowledgement of critical needed change by all. However, leaders should be very sure of their position before moving forward into stage 1. Kotter emphasizes the need to properly select the team of change agents. He closes stage 2 with an emphasis on the need for trust in the coalition. He recommends that trust be built through off site events and activities. The concept of source creditability is critical here as employees' level of trust is affected by evaluation of the leader and past experiences with that leader. It is very interesting that Kotter does not deal with the issue of trust in stage from the beginning of stage 1 which is fraught with the opportunity for false urgency and lost trust. With no trust in stage 1, stage 2 is destined for failure. Stage 6 focuses on generating the short term win. Kotter proposes that a short term win is essential to prove to critics that a fundamental change is good for the organization and to encourage coalition members. At first blush, this appears to pass the common sense test. Mr. Kotter provides graphs representing business transformation results with and without a short term win. However, the reader must remember that there is no data behind the graph or this assertion. There is little or no research on the success of change transformation with and without short term wins. In fact, most journal articles that insist on the importance of short term wins, base their statements on Mr. Kotter's book rather than empirical data. The converse argument could be made that short term wins provide the coalition with a sense of success and may encourage complacency with short term gains. Complacency after all is Mr. Kotter's number 1 error. An additional argument could be made that short term wins may be perceived as a leader's desire to enhance the company's current period financial or project results. More selfishly, short term wins may be perceived as a leader's attempt to attain short term personal gain at the expense of a future successor who must solve long term problems. This perception may be most common in organizations which rotate leaders regularly. If this perception of personal gain for short term wins is evident, trust further breaks down among the leader's coalition and the workforce. It is interesting to note that Beer, Eisenstat, & Spector (1990, p. 164) do not include short term wins in their proposed 6 steps to successful change, while many of the 6 steps do correlate to Kotter's model. Clearly more research is required to validate the need for a short term win and leaders should tread lightly as they architect short term wins for their organization to ensure that they benefit the overall change plan. Leading Change was and continues to be a popular book on the techniques for guiding an organization through changing times. Mr. Kotter presents several concepts and precepts for the leader to remember. He presents his ideas in simple packets of information with stages, steps and error lists. It is a short and friendly book for the reader who may not have time to read a more in depth book. While there are no references in his book, much of what he states is consistent with modern research and theory in leadership and organizational behavior. The lack of depth, theory, data and research is concerning in this book. The concern is more for how the book might be used by a leader, where detail is lacking. While many principles in this book may be used to successfully lead an organization through change, it may also be used by the unethical or selfish leader to justify oppressive demands that ultimately may damage an organization. A description of a structure process of implementing changes in organization. Every step is backed up by real world examples and tips. A volunteer army needs a coalition of effective people – born of its own ranks – to guide it, coordinate it, and communicate its activitie A description of a structure process of implementing changes in organization. Every step is backed up by real world examples and tips. Here's a quick read on an important topic: The leadership and management of change efforts. Dr. John Kotter is a Professor of Leadership at Harvard Business School and this book was written out of his experiences observing and consulting with businesses that were attempting to make significant organizational changes of various types. Kotter recognized that some of these organizations succeeded and others failed, but when they failed there were some fairly consistent reasons for the failure. He hi Here's a quick read on an important topic: The leadership and management of change efforts. Dr. John Kotter is a Professor of Leadership at Harvard Business School and this book was written out of his experiences observing and consulting with businesses that were attempting to make significant organizational changes of various types. Kotter recognized that some of these organizations succeeded and others failed, but when they failed there were some fairly consistent reasons for the failure. He highlights eight major reasons why change efforts fail in organization and then turns this into a roadmap for success, delineating an eight-step change process designed to combat each of the major obstacles. The steps include creating a sense or urgency, developing a guiding coalition, developing a vision and strategy, communicating the change vision and so on. But at the heart of it all is leadership. If a leader (or leadership group) doesn't understand what drives change and chooses not to acknowledge the eight steps, the change effort is likely to stall at some point - probably at whatever stage of the process they ignored. The book is written in short chapters without a lot of jargon and thus is easy to digest. The principles explicated seem to be applicable to both small change efforts as well as large ones. It may not be scintillating, but I found it a very useful read. I am sure I will revisit the ideas in it many times. Very useful read about navigating change processes in organizations in the change-driven 21st century. His 8 stage process (sense of urgency, a guiding coalition, vision & strategy, communicating the change vision, empowering for action,short-term wins, consolidating more wins and producing more change & anchoring change in the culture) is thoroughly proven useful with examples of companies which have ( or failed to) applied these steps. I particularly enjoyed the last chapter about indiv Very useful read about navigating change processes in organizations in the change-driven 21st century. His 8 stage process (sense of urgency, a guiding coalition, vision & strategy, communicating the change vision, empowering for action,short-term wins, consolidating more wins and producing more change & anchoring change in the culture) is thoroughly proven useful with examples of companies which have ( or failed to) applied these steps. I particularly enjoyed the last chapter about individual lifelong learning, and how leadership can come from those we expect it the least, those who have blossomed later in life or have learned through hardships and failure. He emphasizes the importance of risk-taking, humble self-reflection, feedback, careful listening and openness to new ideas as key habits for those who want to cultivate a continuous learning and developing of leadership skills throughout their life. John P. Kotter, world-renowned expert on leadership, is the author of many books, including Leading Change, Our Iceberg is Melting, The Heart of Change, and his latest book, That's Not How We Do It Here!. He is the Konosuke Matsushita Professor of Leadership, Emeritus at the Harvard Business School, and a graduate of MIT and Harvard. He is co-founder of Kotter International, a change management an John P. Kotter, world-renowned expert on leadership, is the author of many books, including Leading Change, Our Iceberg is Melting, The Heart of Change, and his latest book, That's Not How We Do It Here!. He is the Konosuke Matsushita Professor of Leadership, Emeritus at the Harvard Business School, and a graduate of MIT and Harvard. He is co-founder of Kotter International, a change management and strategy execution firm that helps organizations engage employees in a movement to drive change and reach sustainable results. He and his wife Nancy live in Boston, Massachusetts.